The iTaste VV v3.0 is a microprocessor controlled variable-voltage/variable-wattage (VV/VW) personal vaporizer that lets you adjust the voltage or wattage in seconds with just a few button presses. It's quick and easy! Full featured, slim sized, and sporting unique looks, this is a great choice for beginners and advanced users alike. The puff counter will record how many puffs you have taken. The records will be cleared when the device is turned off. Short Circuit/Atomizer Protection helps protect the iTaste VV against faulty atomizers. The iTaste VV monitors the battery voltage and will automatically turn off when the battery is discharged. The iTaste VV battery utilizes an advanced capacity display via green, yellow and red LED lights. Users will know the battery’s capacity via the color of the LED Button. The LED lights will show green, yellow or red to indicate full battery life, half capacity or charging needed. 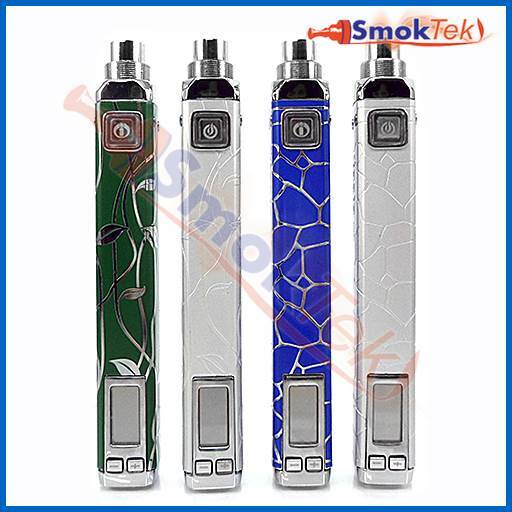 The iTaste VV e-cigarette features a built-in 800 mAh polymer Li-Ion rechargeable battery. The iTaste VV is threaded to accept 510/eGo threaded accessories, including the iClear10, iClear16, iClear30S,iClear30B clearomizers and others! Quickly clicking three times will power the device on or off. Once the device is on, holding down the button will activate the battery. This safety feature prevents the atomizer from turning on while it's in your pocket or bag, as well as inadvertent settings changes. If the button is held down for 10 seconds or longer, the iTaste VV will shut itself off until the button is released. The iTaste VV is charged through a Micro USB Port. You can recharge it with any standard Micro USB cable. It can also work as a pass-through device for simultaneous vaping and charging. The device remembers the last voltage or wattage used when switching batteries. The bright display shows resistance (ohms), voltage remaining, wattage, atomizer voltage output, puff count, and last-used settings.